Hi lovelies! So I asked if you would be interested in the paints I use and my opinion about them and you said YES so here it is. First off, you should know I have only ever tried Van Gogh (VG) and Winsor & Newton (WN) paints, so this is just my personal experience with them and not necessarily a comparison to other paints. Not the most exciting shades of paints, but still very necessary in a palet, so they need to just be solid and reliable paints. I am now using the WN Ivory Black, but I tried the VG Payne’s Grey before that, and I did like it a lot better. The Payne’s Grey has a much ‘complexer’ coloring, with shades of grey and black intertwined almost, instead of just plain black. As far as my browns; I stared out with the WN Yellow Ochre and Burnt Sienna, but I added the Sepia because I wanted to add a cool-toned brown to go with the two very warm-toned ones. As for the pigment, there are a few quite big differences in some colors. Some are very pigmented, like the Yellow Ochre, that don’t need a lot of water to pick up the paint, but some are harder to ‘activate’, like the Burnt Sienna. The brown tones that I have from WN are not ones I have used enough times to say if I like them, because they’re not in my palet right now. Starting with my yellows. I switched from VG Yellow Medium to WN Yellow Ochre just because I ran out of the VG one, and it’s so weird to see the difference between the VG and the WN Yellow Ochre! The VG Yellow Ochre I really do consider a brown tone, while I use the WN Yellow Ochre as a yellow. Which makes a lot more sense, since it’s called Yellow Ochre, haha! Anyway, the pigments of both yellow shades I have in my palet right now (VG Permanent Lemon Yellow and WN Yellow Ochre) are a bit harder to pick up, but maybe that’s just normal for yellows, I don’t really know. I do really like both of them though. As for my reds, They’re both very lovely shades to work with (both VG, Permanent Red Light and Madder Lake Deep), especially the lighter shade, because it’s very easy to make a good vibrant orange with. I have also added two pinks to my palet, both VG, Permanent Violet Rouge and Quinacridone Rose, and I really like them both, even though it’s maybe a little overkill since I don’t really notice a big difference between the two. Now, here’s my favorite section! You all know I love my greens, so I have a lot of them! Only two of these were original VG travel kit colors, but I felt I needed a few more. My favorite shades are VG Sap Green and Olive Green, because they’re warm-toned shades. The one I use the least is one of the ones I got in the travel kit, VG Viridian, because in my opinion it’s too blue, so it’s hard to mix, and feels a little bit ‘powdery’ when I try to activate it with water. I try to make myself use it sometimes, but I still prefer a warm-toned green mixed with blue instead of the VG Viridian, so I may switch it out for the WN Viridian Hue soon and see if I like that one better. A section that was carefully build out from my VG travel kit, which had Ultramarine Deep and Cerulean Blue in it. I think my favorite paint color I own is the VG Indigo and I’m so happy I added it to my blues. It’s so rich and pigmented, it’s great to use for mixing (Cerulean Blue and Indigo together makes a beautiful blue!) and even on it’s own it’s just beautiful on the page. I also decided to add a purple to my palet, because every time I tried to mix a purple I just couldn’t get the shade I wanted and it’s so much easier to just start out with a purple and to mix from there. The VG Permanent Violet Blue is a cold-toned purple, but it’s very easy to mix into a warm-toned one with a little bit of pink. As you can see my love is still with Van Gogh paints a lot, but I’m very excited to try out more paints as I go. 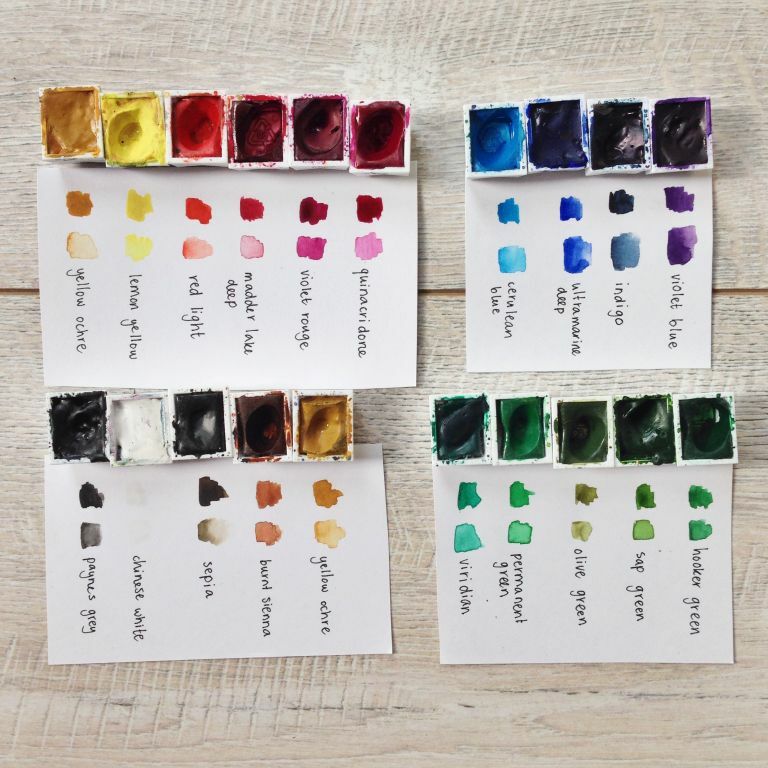 If you have any questions about certain paint colors or just general watercoloring questions, please comment down below or send me a message on Instagram.